The Maracana's iconic sweep of concrete stands may have been replaced by an identikit modern arena -but Colombia's James Rodriguez produced a moment to stir all of the old place's ghosts. He is in the class of Diego Maradona, Lionel Messi and Luis Suarez, according to Uruguay boss Oscar Tabarez. He looks like a boy. Appearances though can be deceptive. He has a man-size talent and he is writing his name in very large letters on the 2014 FIFA World Cup. The 22 years old James Rodriguez in his native Colombia, Portugal and the South of France where he’s played his club football for the last four years, they’ve known about him for a while. In the last two weeks the rest of the English speaking world has been learning to pronounce ‘James’ as ‘Ha-mez’. We knew about Messi, Ronaldo, and Neymar. They were the names on most lips as we headed to Brazil. All three have delivered — though Ronaldo’s influence on a limited Portuguese team was always a concern. No one can question Rodriguez has now earned the right to be mentioned in such elite company. It may never have come to this. Before a ball was kicked, the major question mark hanging over seeded Colombia was how it would cope without Radamel Falcao. The Colombian talisman lost his battle to recover from ACL surgery, but his absence has been a glorious blessing in disguise. Rodriguez would surely have occupied a different and less prominent role had his Monaco teammate been fit. 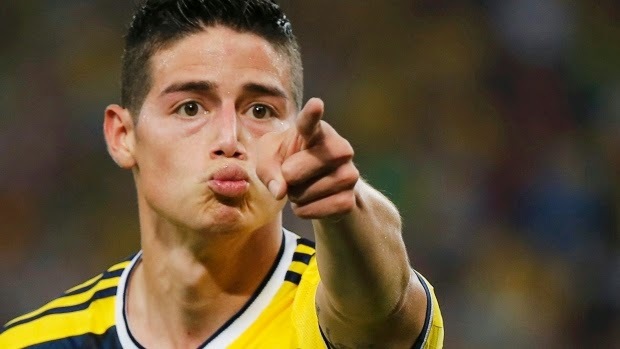 Without Falcao, James has been both playmaker and striker — inspiring Colombia effortlessly into the World Cup quarter-finals for the first time in its history. He is a one-man Golden Generation. All left foot, all confidence and all the talent that comes from years of practice, determination and sacrifice. James’s vision was evident in game one of the Group stage against Greece when he assisted on the first two goals and scored the third himself in the dying seconds. James was just getting started. He would add further goals against the Ivory Coast and Japan to lead his nation to a perfect 3-0 record in Group C. Then, in the historic environs of the Maracana, he brought the house down with a magnificent two-goal performance to send Uruguay back across the border. Who knows where or when it will end? Rodriguez has exploded on the World Cup with a lethal combination of flair and finishing and must be relishing the prospect of facing Brazil in the last eight. The hosts were given a mighty scare by Chile in the round of 16, and will know the hill only gets steeper from here. At the current rate of ascent, James Rodriguez could be heading home with plenty of excess baggage. He is in prime position to win both the Golden Boot and the Golden Ball. As he reflects on another job extremely well done, he would trade both for a chance to get his hands on the real prize — the World Cup itself.